Centro Cultural La Corrala (Aula Roja), Universidad Autónoma de Madrid (C/ Carlos Arniches, 3, Madrid). The seminar Contemporaneidad y Transición: approaches from southern Europe, organized by the project Decentralized Modernities (HAR2017-82755-P), in collaboration with Brumaria and the Department of Art History and Theory of the Universidad Autónoma de Madrid, took place on Wednesday 17 October at the Centro Cultural La Corrala. It brought together some interesting interventions regarding the forms of visuality and aesthetic proposals developed over the transition processes towards democracy in Spain, Greece and Portugal. 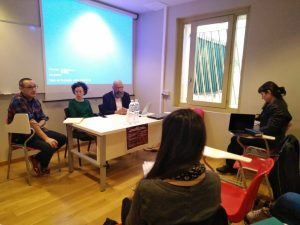 At the same time, this meeting was an occasion to present the recently published volume Art/nsición, Tra/nsición, a second edition of Arte y Transición, 2012, edited in Brumaria by Prof. Juan Albarrán Diego (UAM), coordinator of this seminar. Therefore, the activity was the academic product of the confluence between several projects oriented by the same interest. 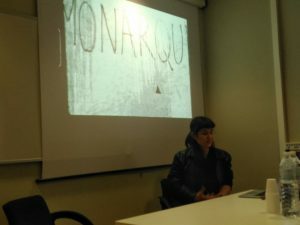 The seminar was introduced by Juan Albarrán, María Ruido (UB) -artist and Main Researcher of MoDes- and Darío Corbeira -artist and Director of Brumaria-. 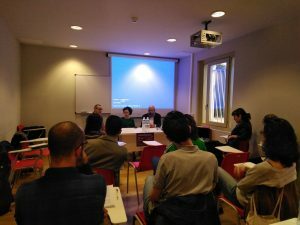 In this introduction the speakers pointed out some transversal aspects in order to contextualize the working hypothesis that underpins the seminar, including the relationship between Spain and Portugal, and the relation between Spanish activists and the revolution of 1974. This gave rise to the first panel, Memories of Struggle and Repression, chaired and presented by Óscar Chaves (CSIC), which included four lectures by some of the authors published in Art/nsición, Tra/nsición. First, the artist Lola Lasurt showed her project Ninguno, a participative action around the figure of Cipriano Martos, an activist from the Frente Revolucionario Antifascista y Patriota (FRAP), who was murdered and tortured by the Francoist police in 1973. The project proposed the re-enactment of three political graffitis that have marked the figure of Martos in three different moments. Lidia Mateo Leivas reflected on activist cinema made during the transition under conditions of clandestinity. She focused on the relationship between form and content and the way it is defined by their dialectical essence (clandestinity/censorship). The recording and production of oppositional images would have been indispensable to carry out “counter-information” tasks and to generate imaginaries required by activism. Mateo points out the documentary impulse of these producers under the will to become public or visible and how their (dis)appearing strategies evolved. A comprehensive processing of this issues can be seen in her contribution to the book (pp. 409-439). Franco’s repression was analysed by David Moriente, focusing on its architectural dimension. The lack of a history of penitentiary architecture and the subsequent management of these buildings is related to conflicts on memory that were left unresolved during the transition to democracy. Moriente’s chapter in the book pays special attention to the genesis and evolution of the Valle de los Caídos and the Carabanchel Prison (pp. 157-193). Juan López, a militant of the Unión Popular de Artistas (UPA), produced some photographic reports during his time in this prison. 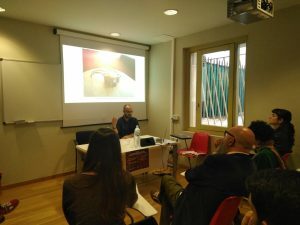 In his lecture, Alberto Berzosa (UM) highlighted the choreographic and performative character of the “collective operation” orchestrated by the FRAP, PC(m-l) and UPA prisoners to get the pictures. Berzosa describes the extreme complexity of the action. Invited by Berzosa and Chaves, López joined the round table debate and underlined the “natural impulse” of this type of “artistic” militancy. Following this first panel, the keynote lecture by Prof. Kostis Kornetis developed a hypothesis based on a “crisis of memory regimes” in the Spanish, Portuguese and Greek societies. Kornetis referred to a “post-memory” (Hirsch) or “projective memory” that is not necessarily mediated by family memory and that will politically instrumentalize the repressed memory of the previous generation. The Greek case is constructed on the basis of Metapolitifsi – regime change -, preceded by the revolt of the Polytechnic University of Athens (1973), which marked the end of the Colonels dictatorship (1967-1974). Kornetis also pointed at the generational conflict that exists since the early years of the financial crisis (2008). This social discontent and the emotional demand for a new truly democratic transition (to reconsider the Metapolytefsi process) gave rise to the movement of the “indignados”. In the seminar’s last part, two audio-visual creations were discussed with their directors, who were concerned with analysing, through film language, the respective transitional memories of the Spanish and Portuguese cases. On the latter, the intervention of researcher and filmmaker José Filipe Costa on his work Linha Vermelha (2011), a documentary on the production of the film Torre Bela (1975) directed by German filmmaker Thomas Harlan. Through interviews with the protagonists of Harlan’s film, Linha Vermelha narrates how the occupation of the Torre Bela estate, which took place during the Portuguese revolutionary transitional period, was situated in the limits between a fictional project and a real revolutionary event. Given that, the occupation of the farm by the workers was governed by Harlan’s cinematographic guidelines. Costa’s film, in its historical perspective, leads us to reflect on the mediated character of the imaginaries of political change. The occupation and the subsequent filming, editing and launching of Torre Bela was used by Costa, in this sort of making off, as a reference to articulate further questions about collective memory, not only in the Portuguese context. The seminar ended with the intervention of María Ruido, who proposed a contextual presentation of her extensive project Plan Rosebud (2008) -divided into two parts: 1. La escena del crimen and 2. Convocando a los fantasmas-. Through a collection of interviews and documentary material organized as a kind of visual essay, the project focuses on the recovery of transitional memory in Spain, in a context marked by the political and legislative struggle around the Ley de la Memoria Histórica. 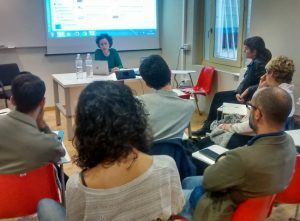 Ruido is not only interested in the Spanish Transition itself, but also in how to generate new stories about the methodology of memory. 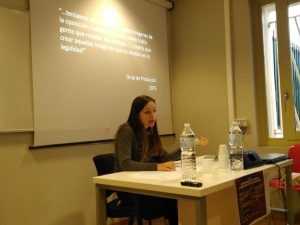 As an example, the fragment that she projected during the session: through testimonies, the declarations of some experts and NO-DO films, Ruido explored the exploitation of tungsten mines in Galicia and the relationships between Franco´s government, Fenosa (a big company) and Nazi´s regime. The closing panel dialogue was chaired by researcher Lee Douglas, who highlighted narrative and conceptual similarities and differences between the referred films. Among the other aspects brought into the debate were the social origins and class distances in artistic practices, the relation with political referents of social transformations, or the violence and fetishism of the testimony, as well as the transmission of the experience in front of the camera.